Knowledge sharing is an integral part of my creative practice and is one of my favorite ways of sharing my research topics and interests. Through my career I have been giving many thematic workshops in universities, exhibitions and festivals. This is where I try to briefly document some of them. Note, these workshops are often extensions of public talks I gave which you can learn more about here. Designers, statisticians, journalists, researchers, activists and technologists often apply visualization techniques in an attempt to see the big picture emerge from large quantities of data. In this rush towards informational imagery both creators and viewers are often taken by the lure of what Edward Tufte defines as “beautiful evidence”. But is information visualization indeed just another type of evidence, or is it a form of visual argument? Groups are encouraged to lie with infographics. Rather than falsifying the data, the dis-info-visualizers manipulate its meaning by creating truthful, yet misleading representations. This workshop is a rare opportunity to explore both sides of the power embedded in the visual display of quantitative information. This workshops inspired an essay and a talk. Previous workshop hosts at: The Open Knowledge Festival, The Info Activism Camp and Shenkar College. 10-25 participants with(some) laptops in a room with internet, projector, post-its, markers and flip boards, access to printing facility a plus. No prerequisite knowledge, design skills a plus, 4 hours minimum. As social media and online services permeate society, we are increasingly expected to trade personal information for access to basic services. In response, some users attempt to conceal hide from data-hoarding corporations using privacy controls and encryption, while others resort to self-censorship or even withdrawal from digital life. But such efforts are often costly and/or futile. In this workshop, we propose a different approach, namely obfuscation. Rather than limiting your digital expression, unleash it to generate a data profile so absurd that no algorithm can make sense of it. Inspired by obfuscation tools such as AdNauseam (which virtually clicks on every Ad it sees) and TrackMeNot (which obfuscates search-query data by randomly issuing fake searches), we invite you to celebrate your online expression and engage in an experimental data performance. “Like” every post on Facebook; “favorite” every tweet with the word “and”; add all of your contacts to Gmail’s “VIP” list… In this workshop, participants will have the opportunity to explore the concept of obfuscation through both historical and contemporary examples and embark on experimental data performances that target the watchful “eyes” of curious algorithms. Experiments will be run over the course of the day, culminating with public presentations of results. Participants should bring a laptop or other electronic device. Previous workshop hosts at: Transmediale Festival, The London College of Communication and Shenkar College. 10-25 participants with (some) laptops in a room with internet, projector, post-its, markers and flip boards. No prerequisite knowledge, 4 hours minimum. How is a whale in the Pacific connected to a space station, a Fitbit and the real Twitter account of one certain president with small hands? 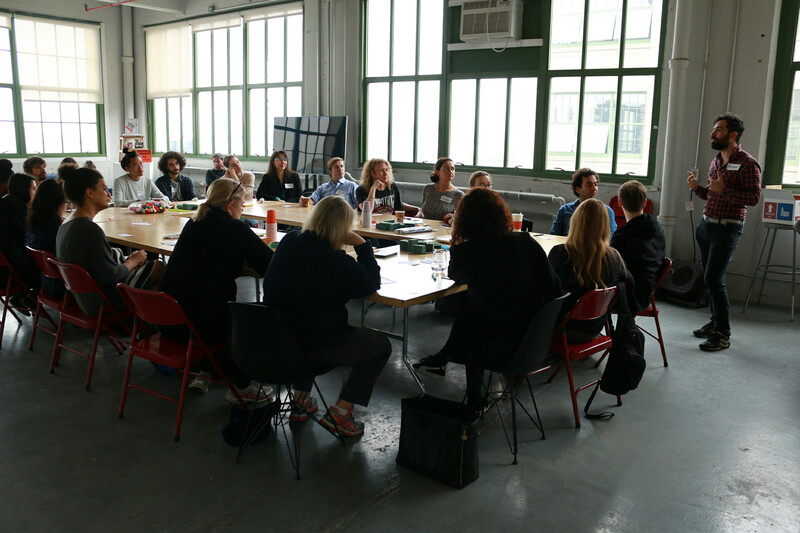 In this hands-on workshop participants are randomly assigned with nodes and are challenged to work together in groups to make establish links and network them all together. The groups construct crafty physical models of their networks and demonstrate both the flow of data and the protocols that govern these follows and connections. Participants can expect to learn basic concepts in system theory, cybernetics and graph theory as well as explore critical themes in technology and communication studies all through a fun, crafty and collaborative process. This workshop was first developed by Ingrid Burrington and Surya Mattu under the title “Networking Session”. I joined them and together we created the “Network Everything” iteration for the Tech By Artist event hosted by Eyebeam Art +Technology Center, New York. The themes of this workshop correspond with my writing on the limits of the network model. 12-40 participants in a room. A list of required art supply will be provided separately. No prerequisite knowledge, 3 hours minimum. Wikipedia is an example for how Open Culture has developed inspiring text-based collaborative models whilst successful models for open collaboration on visual culture remain an exception. Wikipedia Illustrated seeks to develop a methodology for contributing creative-commons licensed illustrations to Wikipedia. This creative workshop addresses the questions at the heart of the Wikipedia Illustrated project. Is the visual aspect of Wikipedia so lacking and dated because it could only use freely licensed images? Or is it that images have to become “historical” to become removed, objective, factual, and therefore applicable to the Wikipedia guidelines? Is the Wikipedia project really inviting visual artists to contribute their work to the commons? Or is visual work inherently less collaborative? As the project evolves it exposes the myths and biases behind these questions and reveals the surprising and complicated dynamics of open culture. Previous workshop hosts at: Transmediale Festival, Art, Environment, Action! at Parsons, CUNY Staten Island. 8-20 participants with (some) laptops in a room with internet and projector. A list of required and recommended art supply will be provided separately. For participants with image making skills, 4 hours minimum. New technologies broaden our ability to remember and transmit history, through a wide distribution of images and texts. This process permanently modifies our relationship to the past. Paradoxically, this rush towards future technologies makes us more and more obsessed with the past. So can we teach machines to forget and forgive? Can we imagine a new relationship with other people, when your friends on Facebook can be algorithmically forgotten? Where Google maps can get lost? How can we deliberately design face recognition to in some cases fail in putting a name to a face? This workshop is focused on the speculative imagination, and is devoted primarily to preparing for future technology and its inevitable mistakes. This workshop is inspired by my writing on Getting Intimate with Invisible Audiences. Previous workshop hosts at: Warsaw Museum of Modern Art. 10-25 participants with (some) laptops in a room with internet, projector, post-its, markers and flip boards. No prerequisite knowledge, 2 hours minimum.